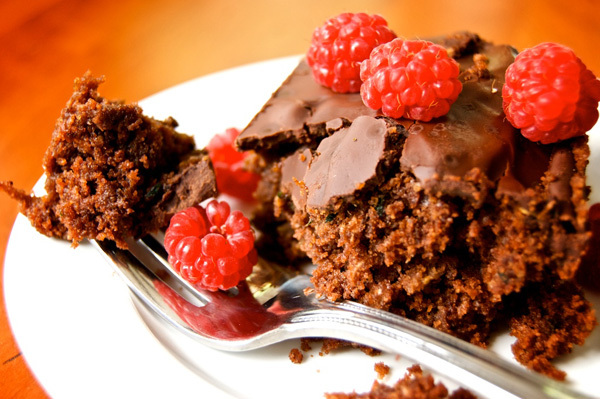 Chocolate Zucchini Cake. Photo Credit Kristin Camplese. This cake is made with whole wheat pastry flour and has much less sugar than the original recipe, which called for 1 1/2 cups—I have cut it back to 1/2 cup of honey and 1/4 cup of sugar. I also used half butter and half coconut oil. Shredding the zucchini is quick work in the food processor, but it can certainly be done by hand, too. I don’t even bother peeling them. And if you have any shredded zucchini left over (and I know you will), freeze it in containers—I mix it into soups and chilis all year long as a veggie booster that you hardly know is there. The resulting cake is really great though—very moist and delicate. It reminds you a bit of the old Texas Sheet Cake or a chocolate snack cake. And given the modifications, it can actually be a decent snack for the kids. 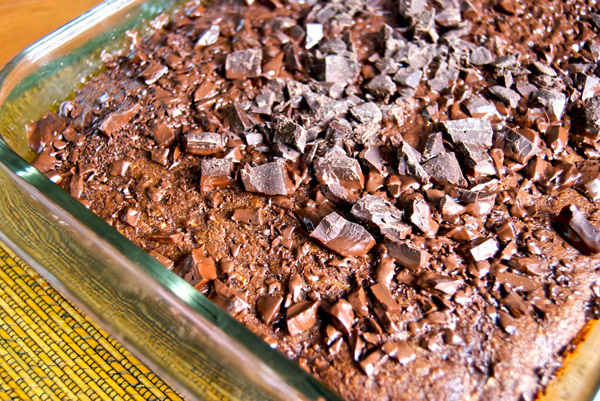 Preheat oven to 325 F. Butter a 9×13 inch glass pan and set aside. Prepare wet and dry ingredients: In a small bowl, combine milk and lemon juice. Whisk in egg and vanilla. In another separate small bowl, combine whole wheat pastry flour, cocoa, and baking soda. In a large bowl, cream together butter, coconut oil, honey, and sugar with an electric mixer. Alternately add the flour mixture and milk mixture in about three separate additions. Mix until just combined and then switch to a wooden spoon or spatula. Stir in shredded zucchini and pour into prepared pan. Bake at 325 F for about 40 minutes.